O'Reilly Introduces New "Photoshop Digital Studio Cookbook Series"
Photoshop is the digital artist and photographer's premier choice for editing and manipulating digital photos. And with the mounting interest in digital photography, the demand for practical guidance, expert techniques, tips and solutions  recipes for success if you will  continues to grow. It's exactly all of this and more that O'Reilly delivers in its beautifully designed and visually stunning new series, the "Photoshop Digital Studio Cookbooks." The book tackles each real-life project in full color, with a hands-on approach. The fully illustrated recipes produce reliable and immediate results, and include "at a glance" panels and tip boxes that cover key techniques in detail. 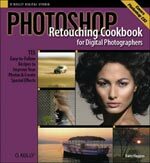 Barry Huggins, the author of Photoshop Retouching Cookbook for Digital Photographers, has created the only recipe-format manual on photographic retouching targeted specifically to digital photographers. Founder of a highly successful multimedia training and consulting company, Huggins is uniquely qualified to deliver step-by-step instruction in digital retouching methodology, with easy-to-follow recipes that address specific problems and teach "best practices" techniques. This is his fifth book on digital imaging and graphics software. Best discount price at Amazon.com (34% off). 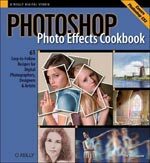 The 61 easy-to-follow, fully illustrated recipes in the book show you how to use Photoshop CS2 to simulate classic camera and darkroom techniques and special effects-without making you first learn Photoshop inside and out. Adobe Photoshop has become the tool of choice for professional photographers, designers, and amateur enthusiasts. But it's a complex application with many features-and scant information on how to use them to best advantage. A case in point: there are 100 built-in filters in Photoshop, designed to enable the user to easily make subtle or dramatic image adjustments, and there is very little online help available with the application, and no printed manual. Users can spend hours trying to use filters effectively-an inefficient and often frustrating way to work. The best part is that you don't have to be a Photoshop expert to create sophisticated, professional-looking results  the recipes take the guesswork out of the process, so you can work quickly and efficiently. 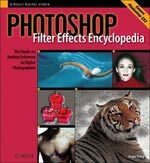 Packed with hundreds of full-color photographs, clearly written instructions, and practical tips, this book is the ultimate, no-nonsense Photoshop CS2 Filters reference for creative photographers, designers, and artists. Unlike Photoshop's built-in filters, blending modes don't change the actual pixels that make up an image, so their effects are completely reversible. There are over 20 blending modes in Photoshop CS2, which range from those which darken and lighten images (such as Darken, Multiply, Lighten, and Screen) to modes that increase contrast (such as Overlay and Hard Light) and adjust color (such as Hue, Color. Luminosity, and Saturation). In addition to covering each blending mode in detail, John Beardsworth, a London-based photographer and author, takes the reader through a whole collection of recipes that demonstrate how to use blending modes alone or in combination to fix problem photos, add subtle effects, and create dramatic images that are truly unique. 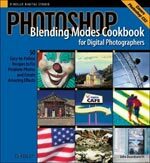 With clear, step-by-step instructions, real-world projects, an easy-to-follow format, and hundreds of full-color examples, Photoshop Blending Modes Cookbook for Digital Photographers is shows you how to use blending modes to achieve a wide range of image adjustments and special effects-without having to first learn everything there is to know about Photoshop.